Like, over half a second quicker to 62, as this video shows. 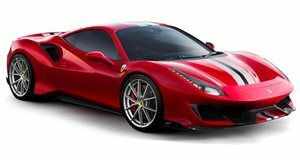 In releasing , Ferrari said it could hit 62 miles per hour from a standstill in just 2.85 seconds. That is some hellacious pace, to be sure. But as it turns out, from watching this video at least, it seems the boys in red may have been a bit conservative on that figure. Driving the 710-horsepower performance machine at the Fiorano test track in Maranello, ArabGT clocked it even quicker. 2.26 seconds, to be precise, or more than half a second quicker than Ferrari said itself. Not only that, but the Pista kept pulling to 124 mph (200 km/h) in under seven seconds, when the factory quoted 7.6. And that's pretty darn impressive. Consider that the offers a very similar package. Both pack twin-turbo V8 engines of about four liters and produce the exact same amount of power and torque. But Woking quotes the 720S for 2.7 seconds to 62, and 7.8 to 124. The packs a bigger engine – a 5.2-liter V10, sans the turbos – but produces 40 fewer horses and 125 fewer lb-ft of torque, deployed to all four wheels. At 2.9 seconds, it's said to take a touch longer to reach 62, and at 8.9 seconds, it's a bit slower to 124. But it managed to hustle around the Nurburgring in 6:52, which only goes to show that there's more to a car's performance than output and straight-line acceleration.